© Olivier Douliery - Pool/Getty Images “This is the most deceptive, vicious world,” Donald Trump said of the world of Washington politics. President Donald Trump defied climate scientists, intelligence specialists and even his own defense secretary on Sunday evening, capping a week of freewheeling press engagements with a sprawling primetime network television interview in which he portrayed himself as an isolated but eminently empowered commander in chief. "I felt comfortable at the beginning, other than it was a little surreal to say I'm the president of the United States, but I think that's true with everybody," Trump told journalist Lesley Stahl during an interview on CBS’ “60 Minutes” that aired Sunday evening. "Now I very much feel like POTUS. I do," he said. "I feel like the president." But Trump also showed signs that reports from the last month — including an anonymous New York Times op-ed describing a “quiet resistance” within the Trump administration, as well as a story alleging that the deputy attorney general considered wearing a wire to record the president — have heightened his sense of loneliness and feelings of paranoia in the nation's capital. "I don't trust everybody in the White House, I'll be honest with you," Trump said, revealing that he is "usually guarded" during meetings. "I always used to say the toughest people are Manhattan real estate guys and blah, blah. Now I say they’re babies," the president said, adding: "This is the most deceptive, vicious world. It is vicious, it's full of lies, deceit and deception. You make a deal with somebody and it's like making a deal with that table." Pressed by Stahl on whether he harbored any regrets from his almost two years in office, the president cited not his administration’s controversial “zero tolerance” immigration policy, his much-criticized response to the violence in Charlottesville, Va., in August 2017, or the various scandals that have plagued several members of his Cabinet. Instead, Trump lamented that “the press treats me so badly” and said he should have moved sooner to terminate the NAFTA trade agreement with Canada and Mexico. In keeping with his condemnation of America’s long-standing allies and praise for its historic foes, the president bashed the European Union as a hostile league “formed in order to take advantage of us on trade” — declaring that “nobody treats us much worse” — and rebuked Defense Secretary James Mattis’ support for a multinational Western alliance. “I’m fully in favor of NATO, but I don’t want to be taken advantage of,” he continued. The president did little on Sunday to tamp down escalating rumors that Mattis would be the latest high-level official to exit the administration. Last week, Nikki Haley, the U.S. ambassador to the United Nations, surprised much of the White House with her resignation announcement. “I think he's sort of a Democrat, if you want to know the truth,” Trump said of the four-star Marine general. 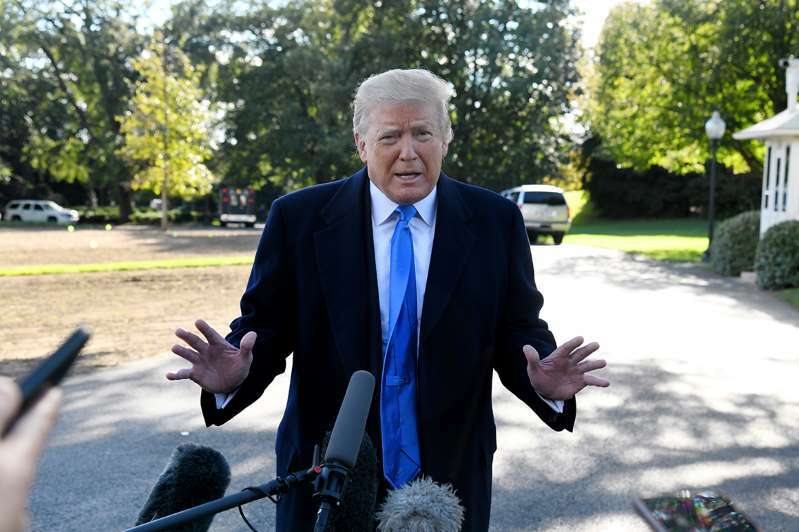 After being read a litany of Kim Jong Un’s alleged human rights abuses, however, Trump insisted he was “not a baby,” and was aware of the various cruelties the North Korean leader carried out against his people. Still, the president said he shared “good energy” and “good chemistry” with Kim, and characterized his frequently warm words for the despot as a means to advancing America’s national security and improving diplomatic relations with a rogue nation. Trump brushed off purported assassinations and similarly malign behavior by President Vladimir Putin of Russia, commenting, “It’s not in our country.” And he rejected the notion that his 2016 presidential campaign coordinated with the Kremlin to interfere in the contest against Hillary Clinton.